“I believe we all have “art” or more truly creativity within us. Getting caught up in the world, making a living, keeping up with the neighbors, dealing with the daily-ness of life tends to blind our eyes and stuff our ears against the possibility of living a creative life. Perhaps the biggest bar to creativity is the fear that we’ll be laughed at. My cure for that is to laugh at myself. When it all becomes very serious and is all about capital-A ART, the joy is gone along with my interest. The love of animals led me to sign up for a sketch class at the San Diego Wild Animal Park because it offered the opportunity to get up close and personal with some of the animals. Not only did I love getting to know unusual animals like a Binturong, but I also discovered I could actually draw! Everything took off from there. Along the way I’ve continued to follow my instincts. 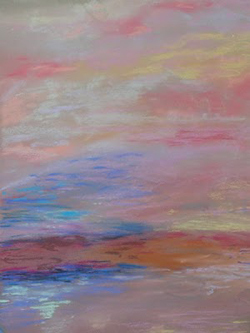 For instance, I signed up for a one day workshop in pastels though I’ve never had a particular interest in that media. Wow! 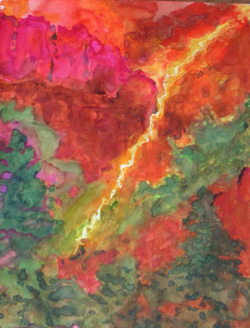 I was suddenly transported to a different world of vivid color, the possibility of mixed media, etc. Eddie McArthur was born in Illinois and raised on a farm. After attending local schools with no art programs available she attended Western Illinois University to major in English/Psychology. Although she had sketched and “played” at art since childhood, work, family and life took over and art was put aside for decades. Many years later, while living in San Diego, California, Ms. McArthur happened to see an ad for a sketch class to be held at the San Diego Wild Animal Park. It was the chance to get up close and personal with animals that led this admitted animal nut to pick up a sketch book and pencils. From there passion took over. 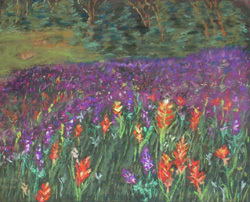 In short order Eddie began painting in watercolor, still her favorite medium. Although she has taken mini-classes like that sketch class, she remains essentially self-taught. Some early success offered enough encouragement for her to continue the path to where she is today. She finds it difficult to categorize herself or her work. Painting in watercolor, acrylic, and mixed media; experimenting with different papers and canvases; addressing subjects from landscape to thought, she tends to work in the media and style that feels right for what she is doing. She maintains a home and studio in Three Rivers, CA, in the foothills of the Sierra Nevada just outside Sequoia National Park. 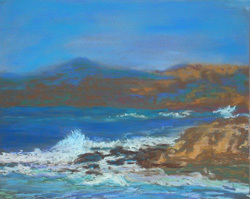 The peace, tranquility and awe-inspiring views have influenced her work. Often weather – a foothill storm, a drought decimated scene, low lying clouds – will dominate both the mood and setting of her current work. 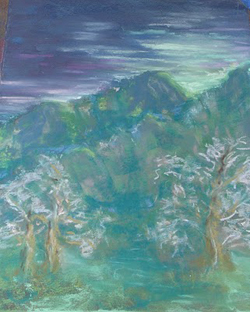 Eddie’s works are in private collections from New York to California. She does a rare commission, mostly portraits of pets or very young children. This entry was posted in Eddie McArthur, STUDIO TOUR 9 and tagged Eddie McArthur, Three Rivers Artists' Studio Tour on March 3, 2010 by Elsah.